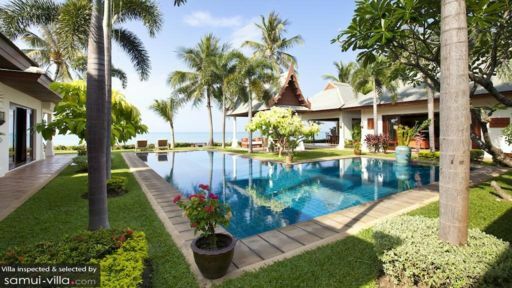 Villa Waterlily is a magnificent beachfront property in Ban Mae Nam area in Koh Samui. The five-bedroom holiday haven sits directly facing the beach with its sandy shores easily accessible to the guests, as it is mere steps away. The villa has something for everyone with its lavish lawns for the kids to run around on, a master suite with a terrace, an opulent swimming pool, and outdoor dining, sitting for everyone to enjoy the scenic view. The spacious bedrooms at Villa Waterlily are furnished with comfortable beds and such to offer you the best stay. With five, air-conditioned bedroom suites, the rooms are decorated with traditional artwork and feature wooden flooring for a luxe ambiance. Two of the five bedrooms have king-sized bed, of which the master bedroom has a private veranda with sitting. 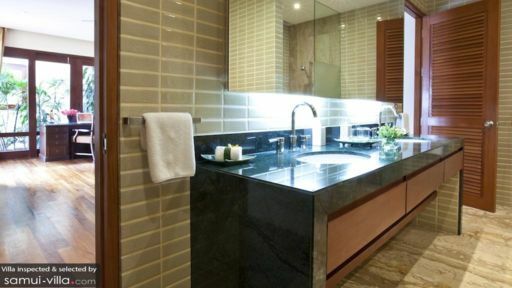 The bedrooms have en-suite bathrooms fitted with natural stone basins, flooring and showers. 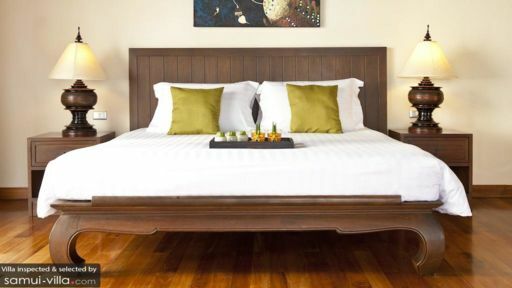 With massive wardrobes and traditional wooden roofs, the rooms will become your personal haven as you lounge on the bed and relish in the calming environment. The sprawling property is remarkable for its landscape and well-manicured lawns which are ideal if you want to do some yoga or meditation early morning while gazing out at the waters of the ocean, the waves crashing on the shores and the fresh ocean breeze blowing around you. The picaresque view will put your mind at ease and as you swim in the 16-metre swimming pool, you are sure to feel all the tension leave your body. A tropical paradise is what Villa Waterlily emulates wholeheartedly as it strives to deliver the best in Thai hospitality in a mesmerizing setting. Sun chairs and daybeds are a plenty around the pool for lounging. A traditional sala holds a nice and comfortable sitting area and a rattan dining area for alfresco dining. A separate dining area has been put up for guests as well with an eight-seater dining table in an open-air setting. The living area is luxuriously furnished with antique furniture, traditional artwork, and a high-vaulted ceiling with hanging lights. The room is fitted with glass doors on an entire wall to allow the natural sunlight to stream inside the room and the air to ventilate its corners for a breathable and refreshing space. A comfy sitting area furnished with brick-red sofas and gold/red cushions is where everyone can gather around, tell old tales while the ocean waves produce harmonious sounds soothing to the mind and soul. The dining area consists of a ten-seater dining table for guests to enjoy a hearty meal to the beautiful view outdoors. The room is decorated with vintage cabinets and exotic lighting for enhanced opulence. The kitchen is fully-equipped and western with modern facilities like a coffee maker, oven/microwave, and everything in between. The villa offers many services to its guests and the kind staff takes care of the cleaning, housekeeping, and maintenance of the villa. If you have any request for additional services, you can always ask the staff for assistance. Mae Nam beach is popular for its clean water which is ideal for swimming and the sandy shores for sunbathing. You can relax at Bo Phut beach, popular for its easygoing vibe and calming ambiance. There are restaurants that you can explore including Angela’s Restaurant and The Boudoir. The quiet area of Mae Nam beach is perfect for a getaway as you get to do what you wish in your own time.